Product information "Skyview FPV Headset"
Connect the device, put on the goggles and immerse yourself in a unique virtual reality experience. Use the Skyview FPV goggles included to secure your place in the cockpit of your copter and see exactly what the drone sees and records. Enjoy a view from above as never before and head off on a hunt for the perfect shot – breath-taking landscapes or cool action shots from the craziest perspectives. The Skyview FPV headset is equipped with a USB port for easy and rapid charging, and with a HDMI port to connect any HDMI-enabled device. After a FPV flight, use Skyview's FPV googgles and HMDI input to watch movies, play video games and more. The HDMI cable can also be used to transmit sound to the goggles. Simply plug the headset into the matching socket headphone, and let there be sound. Thanks to its light weight and the soft padded mask, you can wear the Skyview FPV goggles for as long as you like. Featuring a flexible and adjustable headband, the glasses fit the shape of your head perfectly. The Skyview headset can also accommodate users who wear glasses. Skyview is a high-quality FPV goggle system designed specifically to use with the Typhoon H and Tornado H920. The headset works with any device with an HDMI output. For a unique gaming and cinematic experience, simply connect your Skyview to a game console or video player. Put on the goggles and immerse yourself in a whole new world. The high-resolution and built-in 5-inch (12.7 cm) HD screen features brilliant live images in 720p HD. Skyview also features a 75.5° field of view and a 16:9 aspect ratio for a stunning, life-like display. 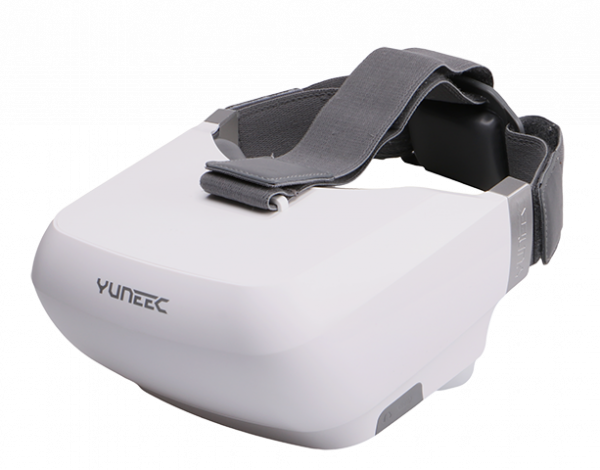 Related Links "Skyview FPV Headset"